The company I work for, Massive Impressions, does the digital marketing for a recruiting and staffing company, SFN Group, headquartered in Fort Lauderdale, Florida. We work very closely with the corporate marketing and IT departments doing advertising, websites, mobile and e-mail campaigns. I work with a e-mail service vendor named ExactTarget, the absolute best among it’s competition. We’ve been doing some innovative stuff for SFN Group that involves ExactTarget’s powerful back end data management features. Because of some of this work, my partner, Lisa, and I were invited to ExactTarget’s Connections 2011 Event to be part of panel discussions. Hers was on Mobile, SMS/MMS & E-mail. I answered questions in a B2B Marketing roundtable and participated in a panel on B2B Social Media. I can’t resist an opportunity to share what works and what doesn’t with people who are so tuned into the online marketing. 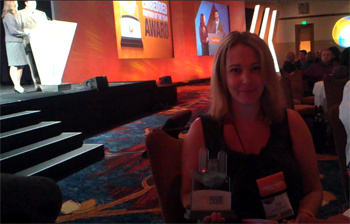 We came home winning the award for Best Mobile Campaign 2011 – and this was no small thing. Some major brand representation was competing. The other winning campaigns were absolutely fantastic. I can’t wait to re-purpose all the super-impactful tactics they used. An enormous thanks is due to our colleagues at SFN Group who participated in this campaign. This was a great example of how businesses benefit from strong integration between the marketing and IT teams. In our case it was more than just an integration – we just worked well as one team. Our goals were clear and common, we knew our roles, and the rest was easy. Thanks everyone at SFN – we won! Do Not Track: Pro-Business or Anti-Business? Upload attachment (Allowed file types: jpg, maximum file size: 1MB.